Six Miami Law students joined 200 lawyers, academics, entrepreneurs, venture capitalists, and students from 30 law and business schools around the globe at the 2015 kickoff for LWOW Original. 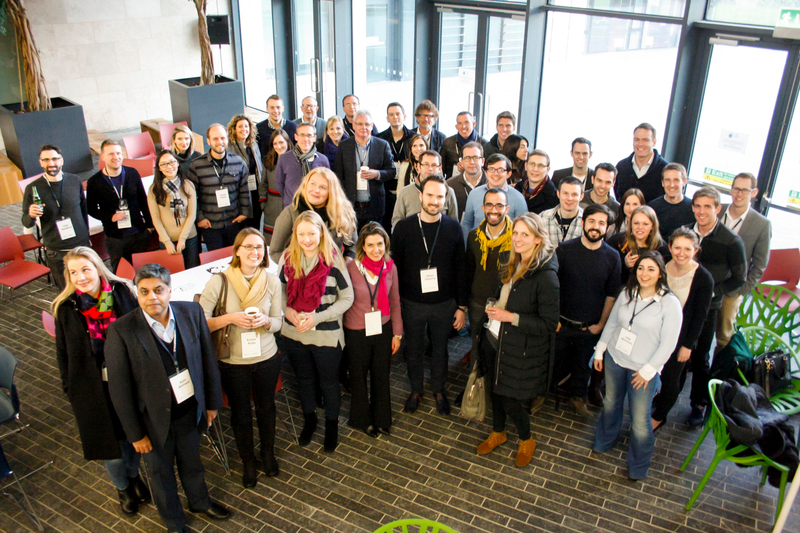 Held at the University College Dublin Sutherland School of Law, the kickoff marked the start of the fifth year of LawWithoutWalls (“LWOW”), the global collaboratory for innovating the future of legal education and practice founded at Miami Law and led by Professor Michele DeStefano. Miami Law students Marlene Duarte, Rachel Streitfeld, Michael Kranzler, Michael Land, Justin Schiff, and Maximillian Viski-Hanka engaged in two days of intensive teaming, idea generation, substantive exploration, and personal development. Along with their teammates from other schools and mentors from a multitude of disciplines, Miami Law students reviewed personality assessments, explored teaming strategies, took part in improv exercises, and observed startups pitch to venture capitalists. In doing so, the students honed their lawyering skills, including project management, cultural competency, networking, social media, and marketing. LWOW Original, a blended in-person and virtual offering from LawWithoutWalls, teams students and a multidisciplinary group of mentors to generate real solutions to problems in legal education and practice. “LWOW Original is an amazing opportunity to identify problems within the legal industry and develop revolutionary solutions as part of an outstanding interdisciplinary team spanning law, business, and entrepreneurship,” said Kranzler, a 3L. Student enrichment was boosted by the participation of over 35 lawyers and lawyer-clients from Eversheds, the world’s leading innovative law firm and the primary sponsor of LawWithoutWalls. “The kickoff is truly inspirational—such a talented, multi-generational, and diverse group unites, galvanized and poised to change an industry that depends on their drive to survive,” said Erika Concetta Pagano, JD ‘13, LWOW Associate Director and LWOW alumna. The Eversheds lawyers and clients are joined by an additional 75 lawyers, business professionals, and entrepreneurs who serve as mentors across all three LWOW offerings. In addition to the core LWOW Team—DeStefano, Pagano, and Program Manager Lauren Madigan—the Miami Law presence also included Professor Robert Rosen, Adjunct Professor and Visiting Lecturer Peter Lederer, and past LWOW students Rico Williams, JD ’13 and 2012 LWOW participant, and 3L Julian Rudolph, 2014 LWOW participant. In addition to LWOW Original, LWOW also offers two entirely virtual offerings: LWOW X and LWOW X Compliance. Both virtual programs held all-day, 9-hour online kickoffs in January. Over the next four months, students across all three offerings will create “Projects of Worth”—business plans that provide solutions to a wide range of problems in legal education and practice. Among the 51 students in LWOW X and LWOW X Compliance, 9 are students from Miami Law. The LWOW experience culminates with the ConPosium, during which student teams present their solutions to a multidisciplinary panel, including venture capitalists. The LWOW Original ConPosium will be held at the University of Miami on April 18-19, 2015. For more information on all the offerings, visit lawwithoutwalls.org.